Mysuru: It is official now, the Mysuru City Corporation (MCC) will finally take up the much-awaited road-widening and other beautification works of Irwin Road, one of the oldest streets of the city soon. It may be recalled various organisations had waged a long battle for the development of this narrow road which had been causing traffic snarls daily. Deputy Commissioner Abhiram G. Sankar has given the green signal for road-widening by 60 ft. (18 meters), beautification of the 850 meters stretch from Nehru Circle (Central Post Office) till Government Ayurveda College Circle. About 76 of the 84 owners of various buildings had agreed for the demolition of their properties to facilitate road-widening and the MCC officials are continuing their efforts to convince the other property owners to fall in line. Irwin Road will be widened by 60 feet after razing down existing buildings on either side and the MCC would purchase the available land for road-widening from the land owners. The Govt., which has offered Rs.13,075 per sq. ft. to the owners, has set aside Rs.33 crore as compensation to land owners. The Government had released Rs.29.75 crore to be distributed among identified property owners. MCC has marked the boundary and is ready to take up the road-widening works after settling full compensation amount of the property owners. The present market value of the land on Irwin road ranges between Rs.7,000 and Rs.8,000 per sq. ft., according to valuators. As the Government has already offered Rs.13,075 per sq. ft., many property owners have agreed for the same and most of the property owners have voluntarily come forward to get their properties demolished to facilitate the road-widening work. Existing buildings would be demolished by 10 to 30 feet. MCC will distribute compensation cheque to the owners on the spot after the owners transfer their land by entering into an agreement and certified at the office of the Sub Registrar. 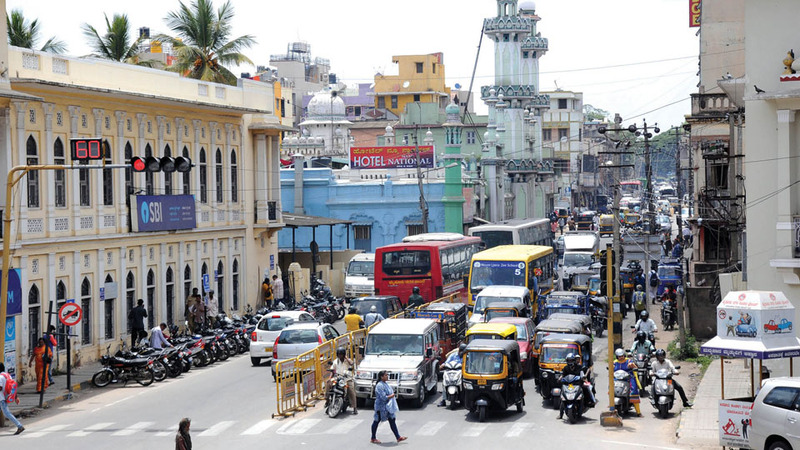 MCC Commissioner K. H. Jagadeesha said that the demolition of the buildings for road widening will be taken up by the end of December this year and added that road widening and Under Ground Drainage system works would begin simultaneously on this stretch. The MCC Commissioner further said that the MCC required Rs. 5 crore for the development of this road and will use its own grants for the road beautification works after taking necessary approvals from the State Government. Though the MCC had planned to widen the road in 2016 and had marked the boundary, the process was delayed as there was stiff opposition from property owners and members of various organisations, he added. If all goes well as planned, traffic congestion and frequent traffic jams on Irwin Road will come down giving a sigh of relief to motorists and those travelling on this road regularly. If history is any guide, all these efforts of widening Irvin Road by demolishing so many buildings will prove to be a total loss to the city. There are situations when widening of roads can indeed contribute to streamlining traffic. However Irvin Road with increasing traffic and also part of the highly congested old neighborhood is not a road where widening will solve the problem. It is unfortunate that no scientific study has been conducted to study what will happen with five years to the traffic on Irvin Road. Neither has any one studied the traffic conditions of the CBD to come up with long term solutions for worsening traffic situation. Master Plan should have studied these problems. But it did not. Don’t be so much Rude to him although I have observed that he usually thinks his view is much superior than anyone else and trying to impose on others. I have seen the pain of Irvin road users daily. Make the entire stretch ‘no parking’ and ‘on-stopping’ zone. In many parts of the city, the extra lane helps people stopping on the second lane for a long time causing congestion, which can be worst than what would have been with single lane on both sides. Firstly it’s should be made oneway and the road plan as per it was on dassara. It will be less painful then spending 33 cores and beautiful old historical building and masjed and temple all will be saved. Firstly it should be made a one-way road and the traffic planning as per it was on dassara. It can be less painful to all, especially to the government as it can save 33+ 5=38 cores as well as save the historical places and worship place and a main market place. As the mysore is know for its historical places and should not demolish them. Well said, Sir! A very sensible solution which saves tax payers money.